The leading social mobile app in the Philippines, WeChat announced recently the successful partnership with Lazada, the country’s online shopping mall to bring users an exclusive surprise and promos in line with Lazada’s 2nd anniversary sale. 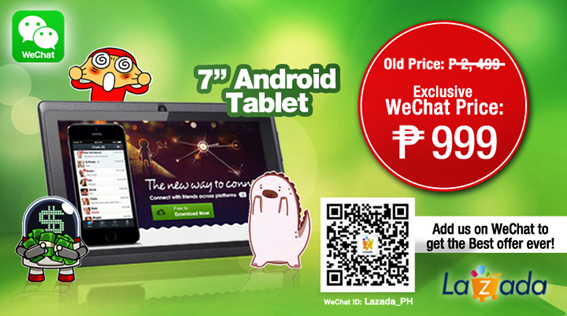 On March 26, 2014, WeChat users grabbed the exclusive deals on awesome items like 7" Android tablet for only Php999. The mobile platform company said that hundreds of tablets have been sold in a couple of hours through the successful team-up with Lazada. These creative promotional ideas, paired with WeChat’s large number of young users, have received positive feedback particularly for its easy to use interface and quick to navigate features. The exclusive offers of Lazada continue as they want to show their gratitude and appreciation to their loyal customers by rewarding them with substantial discounts on best-selling items. The new promotion will give customers the opportunity to purchase their favorite Lazada items through WeChat. Download WeChat for free and have the opportunity to purchase exciting and exclusive deals from Lazada. Lazada offers fast, convenient and secure online shopping experience combined with an extensive product offering in categories ranging from mobiles & tablets and consumer electronics to household goods, toys, fashion and sports equipment. Lazada is continuously striving to offer its customers the best possible shopping experience with multiple payment methods including cash on delivery, extensive warranty commitments and free returns. Learn more about Lazada and download the app on iTunes and Google PlayStore. Like the official Facebook page of Lazada Philippines. WeChat is the world’s fastest growing social app with over 100 million registered accounts internationally. It empowers users in fun and dynamic ways by bringing together messaging, social communication and gaming in one seamless, interactive experience, with comprehensive privacy and security settings that can be tailored as needed. WeChat is an all-in-one app that enables users to add friends with several innovative features. These include highly convenient and reliable QR code scanning, phonebook and location-based connection services such as "Friend Radar”, “People Nearby” and “Shake.” The platform facilitates social interaction with real-time “Walkie Talkie,” “Voice Call,” and “Video Call.” Supported on data networks and Wi-Fi, WeChat makes it easy to stay connected with friends anywhere, anytime. Users can choose to communicate and share photos one-on-one, or within their closed social network through “Moments”. The popular WeChat Sticker Shop has a variety of fun animated emoticons to express any emotion. . Also, with a host of addictive WeChat Games, users can play and challenge their friends on the move, share scores and even find competitors nearby. WeChat is available free for download on Nokia X, Android, BlackBerry, iOS, Symbian and Windows operating systems. Learn more about WeChat and download the app at www.wechat.com.